The mouse is a piece of technology that has been around for a long time and has come pretty far. From the days of the ball mouse, technology has come a long way; not just any optical mouse will cut it when it comes time to game anymore. We set out to find the best budget gaming mouse and settled on the six we’ll be reviewing below. The first mouse on our list is the Logitech G403 Prodigy. A mouse that is on paper the best in our roundup hands down, but one that is also the most expensive (sometimes by a lot, but often not). If that is the case then don’t worry, we get into much more affordable options as we move along, but it’s important to set the bar for what only a few bucks more can get you. This mouse has an impressive 12000 DPI sensor, the most sensitive on today’s list. It is also nearly the lightest mouse on our list coming in at a mere 3.1 oz which makes picking up and repositioning the mouse feel effortless. If lightweight isn’t your thing though the mouse comes with weights that can be added to give it a more standard mouse feel. 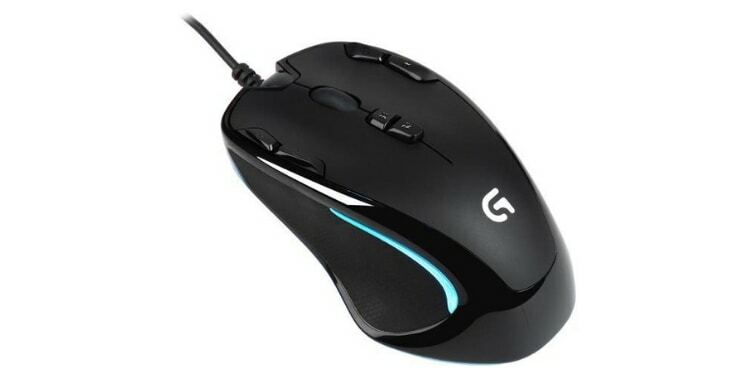 The mouse is lit using RGB which can be customized, along with macros, in Logitech’s G-hub software. While this isn’t the cheapest gaming mouse on our list, it certainly meets the budget need for some and is worth the picking up if you can get it and want a simple high-performance mouse. Typically, Razer is known for making high-end gaming equipment that not only carries a degree of quality but also sports a very gamer-esque aesthetic. In this case, today we’re looking at a much more affordable Razer product that also sports a rather plain look. Despite its “run of the mill” appearance compared to some of Razer’s other offerings, the DeathAdder is one of the most prolific gaming mice ever made. It is used by pros in almost every esport ranging from CS:GO to League of Legends. This is thanks to its lightweight and excellent design. 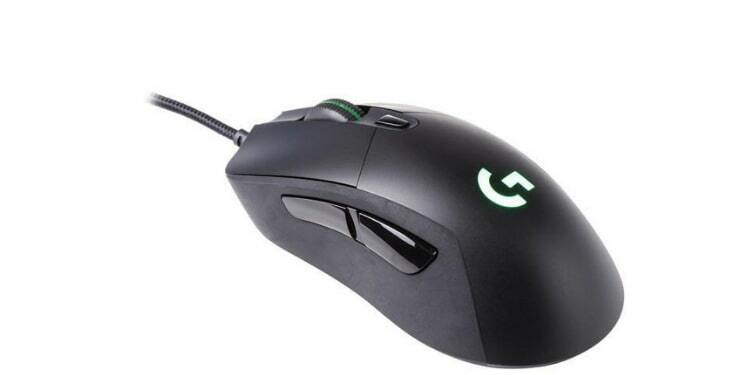 The mouse weighs a mere 3.4 ounces and has rubberized sides that allow for easier gripping. This lets you move the mouse more easily, especially when picking it up to reposition it. This mouse sports a 6400 DPI sensor that is remarkably accurate and responsive. The DPI, as well as macros for all of the five buttons on the mouse, can be customized in Razer’s software. This mouse does not, however, support Razer chroma or have any customization for the RGB lighting, unfortunately. Instead, you are stuck with it being green, so I hope you like green. If you’re a macro junkie, then the prospect of having tons of additional buttons readily at hand and waiting to be programmed sounds too good to be true. But it is with the Redragon M901. 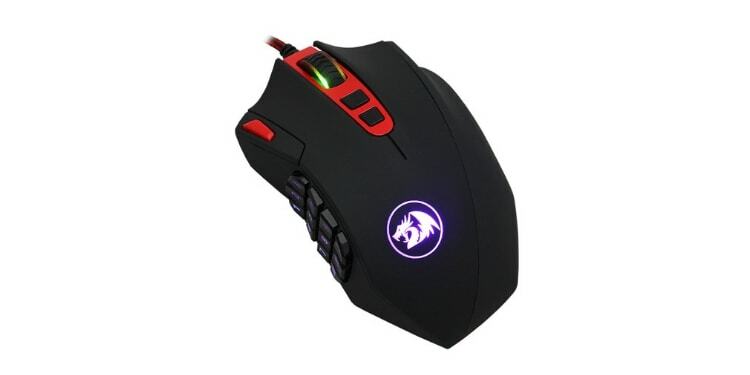 This mouse sports an incredible 18 programmable buttons that can be configured into up to five profiles through software. Unfortunately, the mouse cannot save these profiles onboard, so it might be best left at home. For those who don’t already know, a macro is a button press that triggers an action or series of actions. This can be very useful in games like MMOs where there are reliable combos you want to use in combat, but macros are also very useful in a number of productivity related tasks such as video editing or spreadsheet work. Either way, no matter what you’re using your macros for, the M901 has tons of them. Also, this mouse comes with customizable RGB that can also be color-coded to let you know which macro profile you’re on. This mouse also boasts an impressive 12000 DPI sensor that makes it the best gaming mouse under $30 for those looking to add more macros into their setup. The Logitech G300s is the first gaming mouse on our list that qualifies as being within budget for practically anyone. This is a very affordable gaming mouse that actually sports a number of features that outdo even some much more expensive mice. For starters, it boasts a unique 9 button layout that is symmetrical so it can be used by either left or right handed gamers. There are two buttons below the mouse wheel, two on either side of the main left and right clicks, and the mouse wheel itself. While this isn’t quite as many as the M901 from Redragon, 9 buttons is impressive even for heavy macro users. The buttons can be configured through Logitech’s software and each setup can be assigned to one of the seven colors for the built-in lighting. For the price, this mouse offers excellent quality and a whole lot of buttons, but it does have one major glaring weakness. The sensor only runs at a maximum of 2500 DPI. That alone might not be a huge deal, but the sensor is also not phenomenally accurate. It does at least have a low response time which makes it suitable for low sensitivity gamers. For those looking for a good cheap gaming mouse that is comfortable to use, the Corsair Harpoon is a good choice. This mouse looks simple, but is actually very carefully designed to offer a comfortable user experience. It features a gentle thumb groove on one side and a textured and rubberized side to help you keep your grip. Also, this is the lightest mouse on our list, coming in at a mere 3 ounces. The Harpoon uses a 6000 DPI sensor, making it about middle of the pack when it comes to budget gaming mouse sensitivity. Also, in Corsair’s iCUE software, you can customize the RGB lighting as well as program all six of the mouse’s buttons. While this mouse is super comfortable for most people and offers all of the most crucial gaming features, it is noticeably on the small side. Be aware that if you have larger hands this mouse will not be the most comfortable option, but if you have normal or smaller hands it’s very comfortable. If you’ve read any of our reviews before, then you’ve likely noticed our affinity for including Redragon as a budget-friendly option. 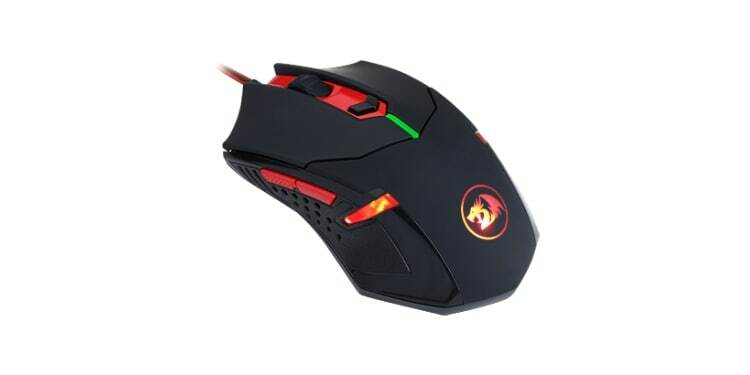 Well, in this case, we’re including the Redragon M601 as a budget alternative to the other products on this already budget-oriented list. Redragon makes very affordable gaming peripherals that are actually shockingly high quality for the price, and the M601 is no exception. Despite its absolutely rock bottom price tag it flaunts a decent 3200 DPI sensor and five programmable buttons. It is also one of the heftier mice on our list coming in at a whopping 5 ounces plus eight included adjustment weights. Unfortunately, the RGB is not customizable and only shines in red. This also makes it hard to tell which of the up to five memory profiles (which can be stored onboard) you are using and what your DPI is set to when pressing the DPI button below the mouse wheel. When it comes to shopping from among the best cheap gaming mice there are a few things to look out for. The most important things to keep an eye on are DPI and the number of buttons. These will let you know what kind of performance to expect and can cue you in on what kinds of things the mouse is designed for. Additionally, be sure to consider weight and ergonomics to ensure you get the mouse that suits your needs best. Before we got into the details about about mice, we wanted to give you a quick tip for deal hunting. We mentioned this in passing from our very first product, but most products online have their prices change relatively often, you just might not realize it unless you are frequently visiting these product pages like we do. Some products will show that they are “discounted” for months despite them effectively just adopting a new, lower price outright. This can give you a false sense of urgency because a product is over 50% off! Don’t want to miss out on that sweet deal. But before you jump at it you should use an Amazon price tracker, like camelcamelcamel.com. For instance, our first mouse, the Logitech G403 Prodigy, is “normally” out of the budget range; however, checking camel shows us that it’s set at, or below, the price of most of the other mice on this list for the majority of the last year. As such, being strategic about when you buy things can help you keep to your budget. Dots per inch, or DPI, is a measurement of how sensitive a mouse is. More specifically, it measures how many pixels the mouse will move across the screen per each inch that the mouse is moved. While many gaming mice have incredibly high DPIs, up to 12000 from the list that we looked at, almost nobody actually uses their mouse with this high of a sensitivity. The two main advantages to having a higher DPI sensor is that it is more accurate and that it is better for very high-resolution screens. Higher DPI will mean greater accuracy even when the DPI is turned down and will lend to a more reliable and responsive gaming experience. However, very high DPIs are also frequently used for those who have very high-resolution screens. Moving across a 4k screen requires four times the distance of mouse travel compared to a 1080 monitor, unless you have four times the DPI. The other important performance-related spec to look at when shopping for mice is the number of buttons it has. Many mice now follow a standard five button layout that includes the left and right clicks, a forward and backward button on the side, and the mouse wheel. Many will also incorporate a sixth button below the mouse wheel that switches between preprogrammed DPI settings. While these are all suitable for most tasks, there are certain things that require more buttons. 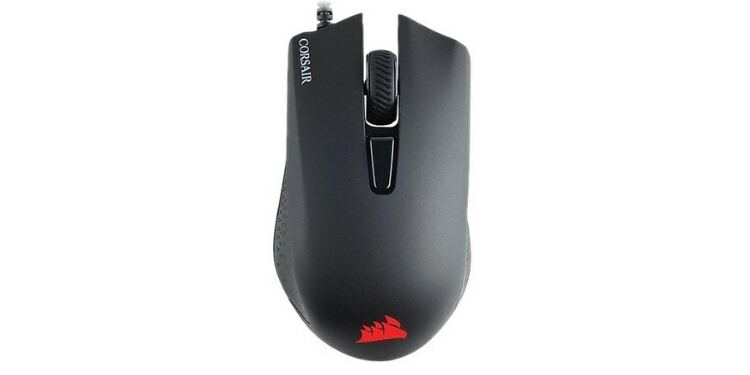 If you plan to use macros for MMOs or work, then consider either getting the Redragon M901 or the Logitech G300s. These are the best budget gaming mice for those who use lots of macros, with the G300s sporting 9 programmable buttons and the M901 boasting an impressive 18. The last major thing to consider when shopping for a mouse is the weight and how it will feel in your hand. While it can be hard to get a good idea of this while shopping online there are a few things to look for. The weight of the mouse will determine how it feels overall. Lighter mice are easier to glide and are easier to pick up and reposition, but some people find that a slightly heavier mouse allows them to make more precise movements. There are some mice on our list, such as the Logitech G403 Prodigy that include additional weights that you can put into your mouse for a weightier feel. As far as ergonomics go, the most comfortable mice on our list are the Corsair Harpoon and the Logitech G300s. The Harpoon is lightweight and super comfortable with its rubberized and textured side, but the Logitech G300s is ambidextrious making it great for left-handers.